The following is from an August 2003 column in Quad-Cities Racing Connection. A Quad-Cities racing legend has taken his final victory lap. Ben R. Hofer died on Friday, Aug. 1, 2003, at his Rock Island home. Services were held Tuesday, Aug. 5. Benny, as he was known to racing fans and friends, was born into a farm family on Aug. 4, 1927, in Andalusia, Ill. Benny was 9 when his father died in 1936, during the height of the Great Depression. The youngster went to work fulltime at the age of 14. That may be when he adopted his lifelong belief that, if you want something, you have to work for it. He married Rose I. Hancq on May 18, 1946, in Rock Island. The Hofers were parents to two daughters and a son and had 10 grandchildren and 13 great-grandchildren. She died June 26 of this year. I met Benny Hofer only twice, but I had watched him race — and win — for decades. After speaking with his friends and fellow racers and attending his funeral, I feel like I knew him well. The two loves of Benny Hofer’s life were racing and his family. 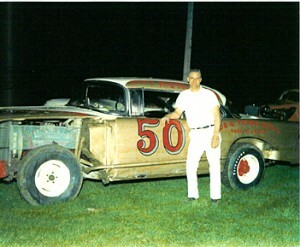 During his stock car career, he won the Illinois State Championship in Peoria three times: 1962, 1963 and 1966. He also was enshrined in 2000 in the Illinois Oldtime Racers Hall of Fame. But he declined to go to Peoria for the ceremony and to pick up his certificate and a medal of honor. Cancer killed Benny Hofer. But it had to work hard to get him. He was given six months to live when diagnosed, but that was six years ago. Some people believe his staying active is what kept him going. Benny enjoyed hunting and snowmobiling. Benny had worked on the assembly line and as a machinist at the former International Harvester Farmall Works, Rock Island, retiring in 1982 after 36 years of service. Retired driver Shorty Bennett, who raced with Benny Hofer at area speedways, worked with him for a year at Farmall. “We had a lively time while I was there,” he recalls. Several things about Benny Hofer are obvious to anyone who hears him eulogized. He did what he wanted to do in life, and he was a perfectionist. He did it his way. Some say Sinatra’s “My Way” could have very well been written for Benny Hofer. He always showed up, for example, at family gatherings. But no one ever knew when to expect him. Benny became more loving and appreciative of his family after he became ill, family members said. While Benny was one of the best drivers ever to turn a steering wheel in the Quad Cities, he also was a lot of fun. Friends say he was a practical joker who had a sharp sense of humor. And he was a genuinely nice guy. He’d do anything to help someone else. • Al Sovanski, who snowmobiled with Benny Hofer: “A nicer friend you could never meet. There’s nothing he wouldn’t do for anybody. He was just a wonderful person to be around. He’d give you the shirt off his back if it came to that. • Owens, the former Hofer pitman: “He was just a great guy. He was a fun person. He had fun with whatever he did. “And he minded his own business. If you did things that he disagreed with, or just things that he wouldn’t do, that was fine. He didn’t criticize other people. He took them for what they were. And he’d give you the shirt off his back. • Larry Adams, who got acquainted with Benny when he and Joe Slininger (who ended up marrying Benny’s daughter) bought a race car from him: “He was one of the best (drivers) in this area, I think. He was a great person. He’d do anything for you. He was just like a brother to me. “I’d seen quite a lot of him in the last few years at Denny’s Restaurant over by the (Moline) airport. We’d chat.” Weedon, who at age 70 is still racing, even invited Benny to pit for him, but he wanted no part of that. • Duane Smith, who crewed for Benny: “Benny Hofer was more like a brother to me than a friend. We had known each other for 50 years. I’ve got nothing but good memories about the guy. “What he had, you could have. If he didn’t have it, he’d find it for you. And if you were looking for something, you could go down to his garage, and he’d say, ‘I know right where that’s at’ and go back and get it for you. He was just one of those kind of guys who just stands out in a crowd but never wants any attention brought to himself. “I have nothing but good memories. We snowmobiled together and had such wonderful times. He was just a true friend and anything he had you could have. If you broke it, you replaced it. That was kind of our motto with all the guys we hung around with: ‘You can have anything I’ve got, but if you break it, you fix it or replace it.’ And everybody always did. It was the famous black and white number 50 that was Benny’s trademark for many years. • Shorty Bennett, who retired from racing after the 1975 season, said when they’d get done racing at the track, the two drivers would race each other home. “We used to leave the track, and the race was on again. We were the best of buddies. We worked together, we went hunting together, we raced together, we went to Daytona together. We were the best of friends. • Duane Steffe, a retired driver who was friends with Benny: “He was a legend, you’d have to say.” Steffe began racing Sportsman cars in 1969 and advanced to Late Models in 1971. He likely raced against Benny, who retired in 1972, for at least a season or two. Legends aren’t supposed to die; they’re supposed to live forever. And in the hearts and minds of many, Benny Hofer will do just that.